At the State Fair of Texas, we put our stomachs to the test as we ate as many of the fried goodies that we could. As we nibbled, we sat with the recorder and captured our thoughts. At the fair this year we tried to hit booths that had some unusual options - not just the standard funnel cakes and elephant ears. The only exception I made to this was the corn dog - because of what I heard eavesdropping. I was standing in line to buy a cold Big Red when a crusty old cowboy-lady told her fair-going friends that the only thing she wanted to eat was a Fletcher's and then she could go home and wait until the fair came back next year. Having had a particularly bad corn dog at the Puyallup Fair back home, I was determined to have a better one, and my friend Jessica assured me Fletcher's was the genuine article. Only problems were the lines - all of the Fletcher's booths were at least an hour deep from the time the fair opened that morning. We'd have to hit it in the afternoon. The first thing we tried was this year's award winner for creative fair food (really! 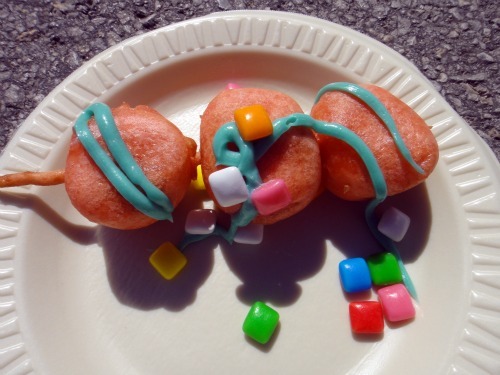 ), fried bubblegum (pictured top). It came 3 to a stick, and was covered in teal-blue frosting and was sprinkled with Chiclets. This was perhaps not the right thing to start the day with - a sugar-soaked fried contraption - but sacrifices were required and we each took one in the name of pseudo-science. The laughter of the surrounding families proved what we knew from the mess in our mouths. This thing was nasty. Imagine a bubblegum-flavored marshmallow melted to the magma stage, then topped with grainy blue frosting that stains your teeth. That, my friends, is fried bubblegum. 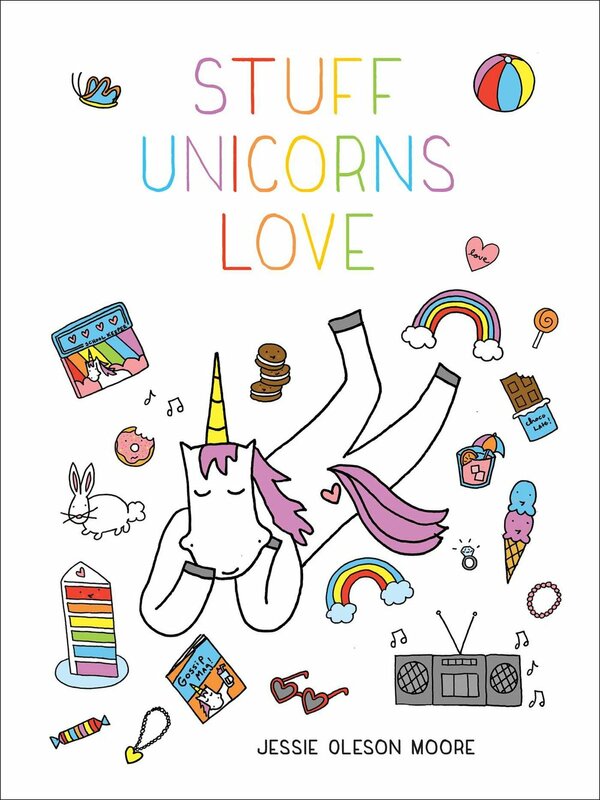 Out of 10 stars, this didn't even make the charts. Dying to get the flavor out of our mouths, we went for fried beer. Not just any fried beer, but Shiner Bock, a little local from Shiner, Texas. I'd expected this to be a beer-flavored pillow, and was surprised to find hot liquid beer dribbling out of the fried ravioli case. Dipped in cheese sauce, this was a 5 out of 10. Needed more salt, but it was good at wiping the fried bubblegum slate clean. Frito pie is a ballpark tradition and must be something of a Texas thing because we ate these in elementary school. Open a bag of Fritos, ladle all-beef chili into the bag, and then top liberally with cheese. So when I saw the fried Frito pie, I knew I had to try it. Besides, a friend of a friend invented it and I knew I wasn't leaving the park without some in my belly. It was a plate of fried dough balls made of Fritos, chili and cheese, and was topped with sour cream and salsa. When all of the components came together, it was magic and took me right back to the school cafeteria. Easily a 7 out of 10. The only thing I'll say about the Fletcher's is that it was the real deal. And I bought a shirt to commemorate the awesomeness of this corny dog. 9 of 10. Deep-fried MargaritaThe most surprising treat at the fair was the fried frozen margarita. We declared this one the winner before we even took our last bite of fair food, we were that confident in it. As the two of us sat on a crowded picnic bench, Texas neighbors watched and laughed as we first nibbled, and then chugged our way through the margarita. It was served in a classic margarita glass, salt-rimmed and all. Fried funnel cake bits were scooped into the glass, then a generous pour of ice-cold tequila and lime syrup soaked it all (in fact, there was more liquid than fried nuggets). 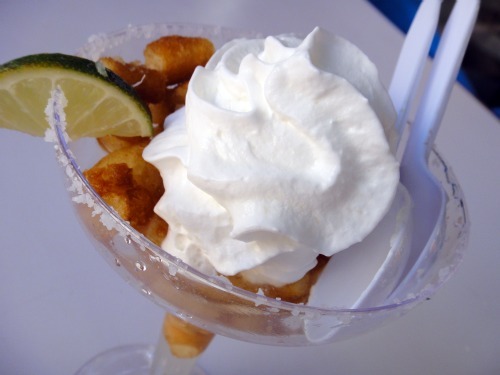 Topped with a little whipped cream and a thin slice of Persian lime, the fried frozen margarita was refreshing, surprising, and highly alcoholic. Tequila giggles ensued, and this winner clocked in at a 9 of 10. Deep-fried PB SandwichThe last booth we visited boasted the Elvis - a fried peanut butter, jelly, and banana sandwich. It was served quartered, dusted with powdered sugar and a drizzle of grape jelly, and was very very hot. The sandwich insides oozed out when we took bites, and we decided that the banana really made the treat work. Alone, the PB&J was average. Add a hot fried banana to the mess and you have a contrasting flavor and texture, along with a little moisture. Definitely an 8 of 10. Perhaps the happiest moment of the fair was as we were walking out. The day had been filled with sugary sweets and fatty snacks, and rather than drinking water in the heat I kept chugging a warm Big Red. Just after I tossed my soda bottle we encountered a tooth brushing station - sponsored by a big-name toothpaste company. Even though we felt like idiots brushing and spitting in a community trough, the sensation of getting the day's sugar off my teeth was welcome. I could almost have gone back for more. For more of Jenny's adventures, visit Purple House Dirt.